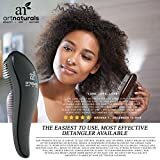 ARTNATURALS PREMIUM DETANGLING BRUSH 100% SATISFACTION GUARANTEE: Your satisfaction is what drives us to provide the highest quality health and beauty products on the market. If at any time you are not completely satisfied with your purchase feel free to return it to us for a full and prompt refund. At ArtNaturals we stand committed to the production of paraben free and cruelty free goods, that is why our Detangling Brush is made with paraben free, and chemical free materials and was never tested on animals. Building relationships of trust with those committed to an all natural and healthy lifestyle is what we do if at any time you have questions or ideas about how we can serve you better, we would love to hear from you. THE GLOBAL BEAUTY PHENOMENON NOW AVAILABLE TO YOU. The premium solution to detangling knotted and matted hair is finally available to you. 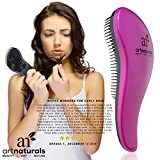 Around the world people have been singing the praises of the new detangling brush that has made taming knotted hair a simple and painless joy. 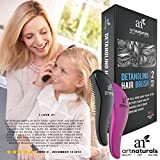 Now ArtNaturals is excited to offer you this innovative solution to the often painful, (and as parents can attest) stressful task of removing tangles, knots, and curls from unruly hair of all types. Say goodbye to bulky and awkward brushes that dig into your hair and scalp while never separating or unfurling knotted hair. Our Premier Detangling Brush uses innovative design and ergonomic motion to give you and your loved ones a pain free and unmatched brushing experience. Try for yourself backed by our 100% guarantee and say goodbye to painful, tugging and damaging pulling. 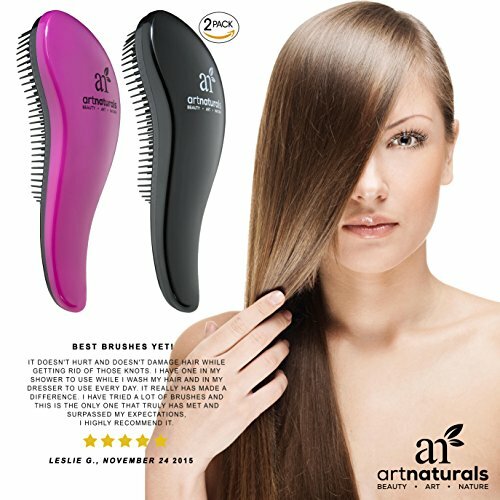 A tear free solution that delivers silky smooth results is here, with ArtNaturals Premium Detangling Brush. 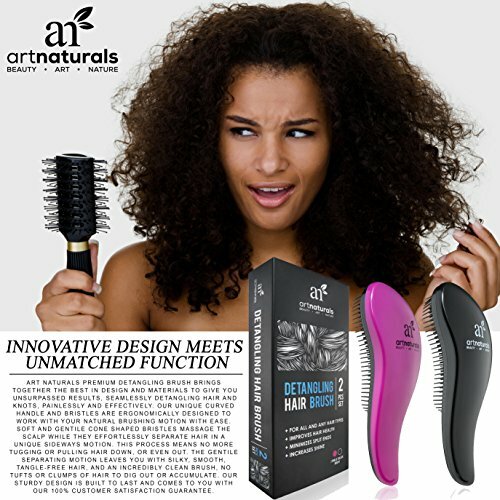 INNOVATIVE DESIGN MEETS UNMATCHED FUNCTION: ArtNaturals Premium Detangling Brush brings together the best in design and materials to give you unsurpassed results, seamlessly detangling hair and knots, painlessly and effectively. Our unique curved handle and bristles are ergonomically designed to work with your natural brushing motion with ease. Soft and gentile cone shaped bristles massage the scalp while they effortlessly separate hair in a unique sideways motion. This process means no more tugging or pulling hair down, or even out. 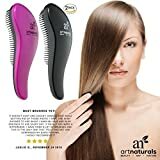 The gentile separating motion leaves you with silky, smooth, tangle-free hair, and an incredibly clean brush, no tufts or clumps of hair to dig out or accumulate. Our Sturdy Design is built to last and comes to you with ArtNaturals 100% Customer Satisfaction Guarantee so you can try risk free in your own home. ARTNATURALS PREMIUM DETANGLING BRUSH 100% SATISFACTION GUARANTEE: Your satisfaction is what drives us to provide the highest quality health and beauty products on the market. If at any time you aren’t completely satisfied with your purchase feel free to return it to us for a full and prompt refund. At ArtNaturals we stand committed to the production of paraben free and cruelty free goods, This is the reason our Detangling Brush is made with paraben free, and chemical free materials and was never tested on animals. Building relationships of agree with with those committed to an all natural and healthy lifestyle is what we do if at any time you have questions or ideas about how we will serve you better, we would love to hear from you. THE GLOBAL BEAUTY PHENOMENON NOW AVAILABLE TO YOU. The premium solution to detangling knotted and matted hair is after all available to you. Around the world people have been singing the praises of the new detangling brush that has made taming knotted hair a simple and painless joy. Now ArtNaturals is excited to offer you this innovative solution to the continuously painful, (and as parents can attest) stressful task of removing tangles, knots, and curls from unruly hair of all types. Say goodbye to bulky and awkward brushes that dig into your hair and scalp even as never separating or unfurling knotted hair. Our Premier Detangling Brush uses innovative design and ergonomic motion to give you and your loved ones a pain free and unmatched brushing experience. Try for yourself backed by our 100% guarantee and say goodbye to painful, tugging and damaging pulling. 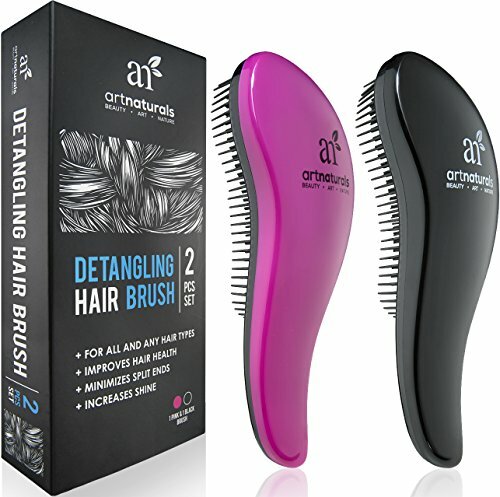 A tear free solution that delivers silky smooth results is here, with ArtNaturals Premium Detangling Brush. 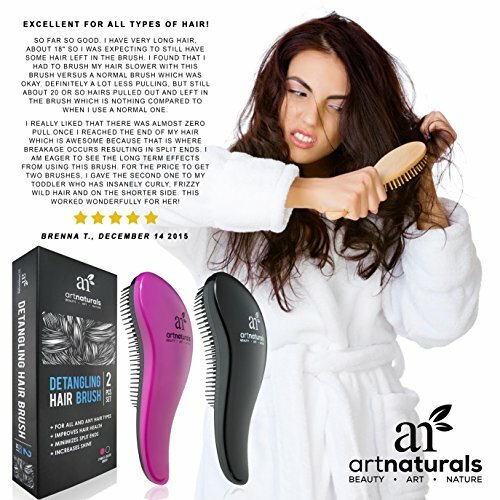 INNOVATIVE DESIGN MEETS UNMATCHED FUNCTION: ArtNaturals Premium Detangling Brush brings together the best in design and materials to give you unsurpassed results, seamlessly detangling hair and knots, painlessly and effectively. Our unique curved handle and bristles are ergonomically designed to work with your natural brushing motion with ease. Soft and gentile cone shaped bristles massage the scalp even as they effortlessly separate hair in a unique sideways motion. This process means no more tugging or pulling hair down, or even out. 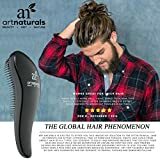 The gentile separating motion leaves you with silky, smooth, tangle-free hair, and an incredibly clean brush, no tufts or clumps of hair to dig out or accumulate. Our Sturdy Design is built to last and comes to you with ArtNaturals 100% Customer Satisfaction Guarantee so you’ll be able to try risk free in your own home. THE EASIEST TO USE MOST EFFECTIVE DETANGLER AVAILABLE: Our Premier design is simple to use for Men, Women, and Children. Simply brush as normal after showering or bathing. Brush in downward strokes allowing the unique cone bristles to work with your motions, separating hair sideways as you brush. Tangled and knotted hair will begin to unfurl easily and painlessly as you stroke without tugging or pulling. Unique Bristle configuration is easy to clean and maintain. Simply run detangling brush under warm water after each use. No need for pulling out unsightly clumps of hair or tedious cleaning. THE HIGHEST STANDARDS OF EXCELLENCE: At ArtNatural we are committed to providing you with the very best in health and beauty products. We remember the fact that you place your agree with in us, to provide you with quality, protected and ethically conscious products. We take that agree with seriously and are committed to products that meet the highest standards of excellence. Our Detangling Brushes are made with the highest quality materials and come to you free of parabens, or harmful plastics. All our products are meet the highest levels of consumer safety and transparency. Our love of beauty stretches beyond humanity and strives to see the wonder in all of nature. This is the reason our packaging is made with recycled materials and our products are cruelty free and never tested on animals.